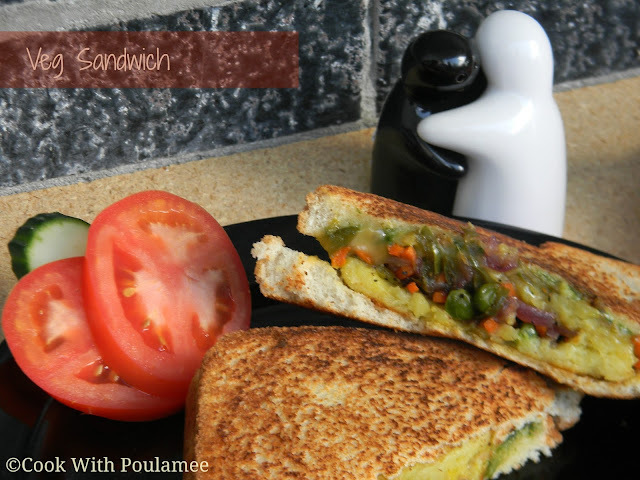 Cook With Poulamee: Veg Sandwich: My Simple Brunch. 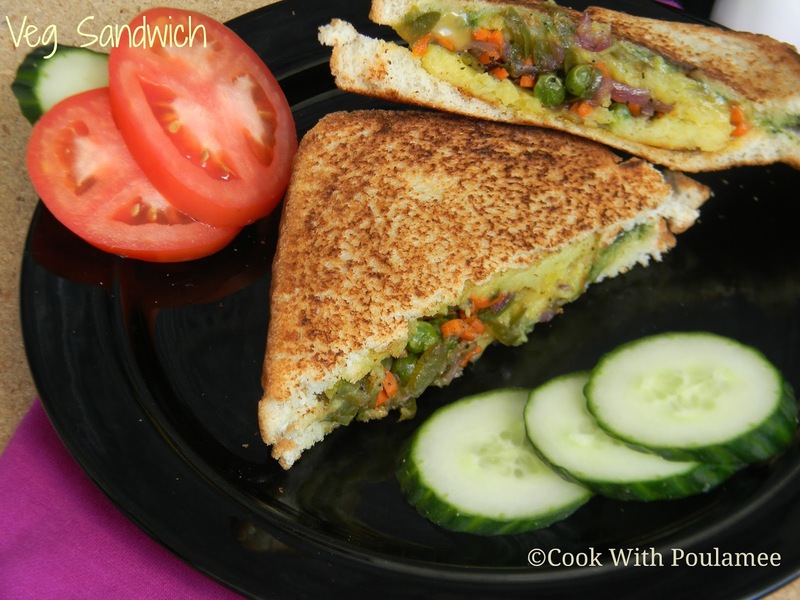 Veg Sandwich: My Simple Brunch. Most of the mornings I get really busy with my daughter and all my household works, so I don’t get time to have my breakfast in time. So I prefer to make brunch for me. It’s time saving and perfect for a busy day. I know skipping breakfast is not a good job but some time we are helpless. One of my very favorite brunch items is simple VEG SANDWICH with a slice of fruit or any Juice. Today I was really busy with my cleaning and washing so very quickly I made this sandwich for my brunch. And my daughter loves this too which is really good for me because she is very choosy about food. 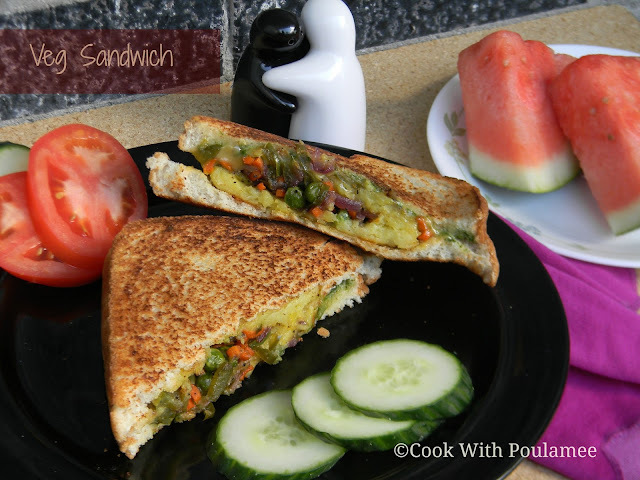 This type of sandwich is good for lunch box and small picnic also. 2.Finely chopped carrots, Onions, Green peppers and green peas: ½ cup. 3.One medium size boiled potato. 5.One table spoon bread crumbs. 6.Pinch of black pepper powder. 7.Salt and sugar as per taste. 9.One tea spoon vegetable oil. 1.Chopped coriander leaves: a hands full. 4.Very little amount of ginger. 5.Salt and sugar as per taste. For making chutney, in a blender add the coriander leaves, mint leaves, ginger and green chili and blend it. Now add the lime juice and little salt and sugar mix well. Your coriander chutney is ready for sandwich. Now in a vessel add the oil and slowly add the chopped veggies with some salt, sugar and black pepper powder and cook for 5 to 6 mint in low flame with a lid. Now remove from heat. Now smash the boiled potato with a pinch of salt, now make two small balls with that. Take one ball in your palm and flatten it now add the cooked veggies on top of that. Now take the other ball and flatten it with the hand and cover the veggies and make a stuffed round flat shape ball. Sprinkle some bread crumbs all over the stuffed ball. Now in a frying pan add some oil and pan fry the stuffed flat ball till both the side turn brown. Now remove from heat. Take one bread spread some butter first, now spread the coriander chutney, now place the cheese slice on top. Now place the fried stuffed ball on top. Now take the other bread and spread some chutney now place the bread on the top of the stuffed ball (the side you spread the chutney must be on down). Now in dry frying pan in medium heat place the sandwich and fry both the sides till they turn little crispy and brownish do it very carefully. 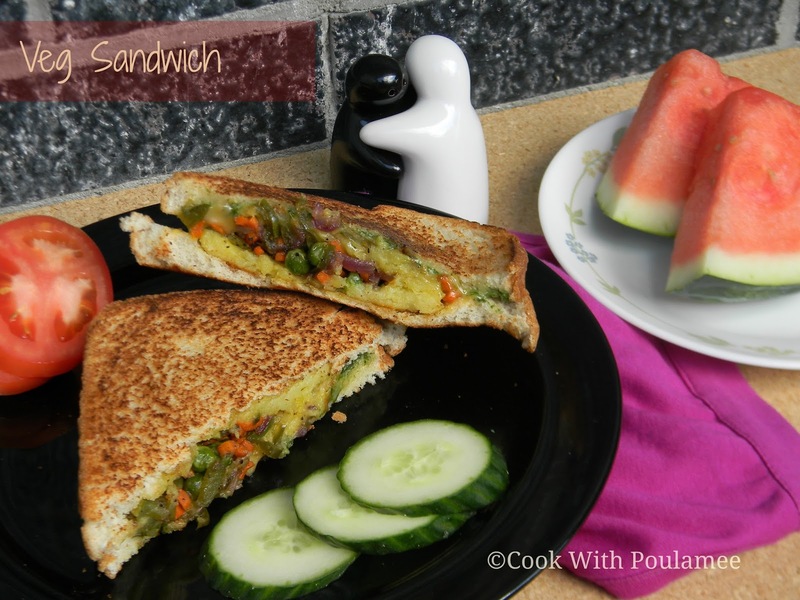 Your easy and super first VEG SANDWICH is ready enjoy your brunch.